Hyundai Santa Fes have been part of our roadscape since 2001. For 2017, the mid-sized six passenger SUV welcomes its third generation. Our eyes have grown accustomed to SUVs. 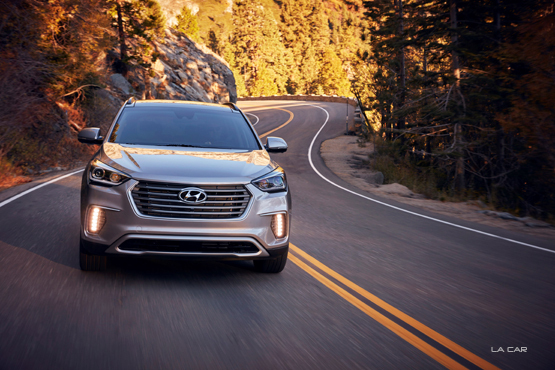 The redesigned Santa Fe is a recent graduate of Hyundai’s Southern California design center. The new look is fresh, flowing, functional, and definitely stands out from the crowd. We’ll not go so far as to claim any SUV as resetting the “classic styling” line, but we can safely state that our 2017 Santa Fe turned plenty of heads. The interior is larger than we imagined from outward appearances. Leather clad front seats are heated/ventilated, electronically adjustable in more ways than you’ll ever use, and provide a secure base from which to enjoy the drive. Two rows of rear seats are also heated/ventilated and quite comfortable. Second row passengers enjoy leather captain’s chairs. All rear seats fold down to increase cargo space. An automatic dual zone climate system allows the driver and front seat passenger to decide for themselves how warm or cool they wish to be. 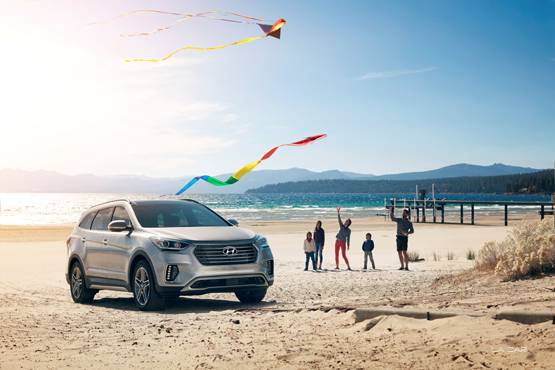 We can only guess about the usefulness of Hyundai’s CleanAir Ionizer, but can well imagine its worth during allergy season. Our huge panoramic sunroof saw plenty of use during test runs. Santa Fe’s center control console is classy in appearance yet simple to operate. Controls are clearly defined and easy to navigate. Gauges are directed to the driver and clustered into a cockpit-like arrangement. An 8-inch touchscreen navigation system was easy to read and, well, navigate while proving resistant to fingerprints. USB connectivity points abound throughout and a 115-volt outlet is provided in the cargo area. Santa Fe is a drive-by-wire vehicle. It took us a bit of thinking until finally hitting upon what felt so different about driving this SUV. Throttle response is quick, brakes are solid, steering precise. But overall vehicular feedback has been transformed by electronic controls. The Motor-Driven Power Steering unit is where we noticed it most. People new to the driving game or perhaps those not as attentive may not notice. But we were keenly aware that something is up. Never did we feel unsafe or out of control, the Santa Fe just felt different. Drivers may never employ Hyundai’s Automatic Emergency Braking System but it can prove helpful in unforeseen circumstances. Utilizing both cameras and radar sensors, the system applies the brakes when it decides that the driver is not reacting to an imminent crash. Full braking power will deploy up to speeds of 50 miles per hour. Though useful, we’ll go on record and state outright that drivers should always rely on their own experience before trusting an electronic system. But in that rare instance, it’s good to have backup. 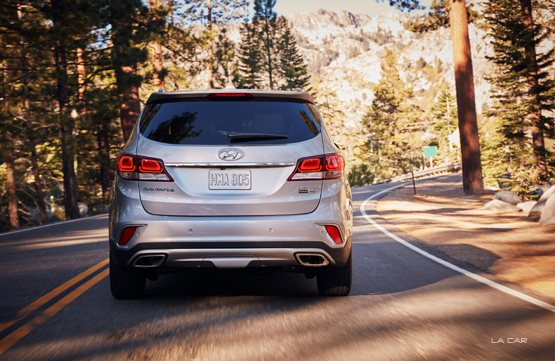 We came away very impressed with the 2017 Hyundai Santa Fe. Roomy, comfortable, responsive, good looking, and priced right for its market segment. Hyundai also has one of the best warranties in the business. We could well imagine one on our driveway.